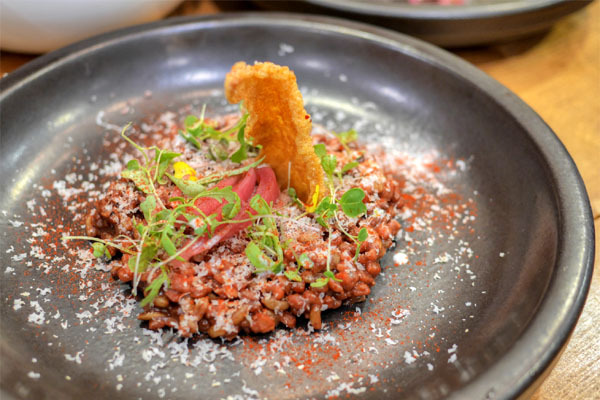 Set in one of LA's sadder strip malls in a sleepy, still-gritty section of Hollywood is one of the most fascinating restaurant debuts of the year. Baroo takes over an address that previously held no fewer than three ho-hum Thai joints: Joe Noodle, Anna S Thai Mix Grill Restaurant, and Sunshine Restaurant. 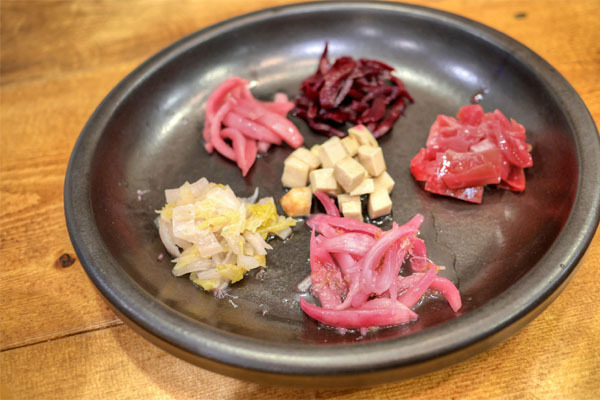 Described by its owners as a "free-style experimental kitchen," the place opened in mid-August and aims to highlight the role of fermentation in the kitchen. 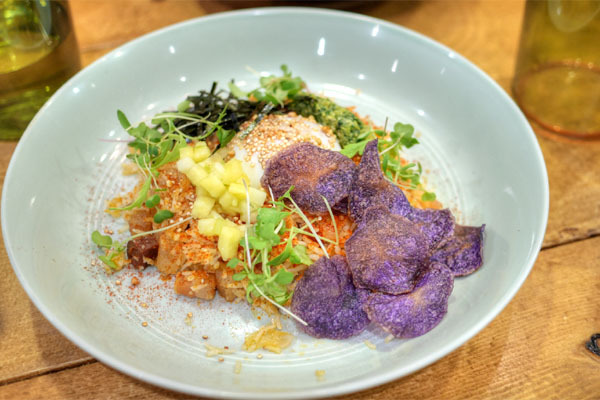 It's the work of Chef/Owner Kwang Uh and partner Matthew Kim (an NYU grad who used to run the American operations of Korean bibimbap chain Bibigo), childhood friends who met while attending school in Korea. About the Chef: Uh hails from Seoul, but moved to the US to attend the Culinary Institute of America at Hyde Park. He began his studies there in 2007, and after his first year, interned at Terrance Brennan's French-Mediterranean eatery Picholine. After finishing in 2009, he took on a chef de partie role at Daniel Boulud's iconic Daniel, where he stayed until 2010. This was followed by a stint as Executive Chef at Nobu at the Atlantis resort in the Bahamas from 2011 to 2013. Uh then went back to school at the Università degli Studi di Scienze Gastronomiche in Piedmont, Italy, where he attained a master's degree in Food Culture and Communications in March 2014. He subsequently underwent a series of stages at some of the world's best kitchens--modernist Italian mainstay Piazza Duomo, techno-emotional standard-bearer Quique Dacosta, New Nordic darling Noma--before relocating to LA to start work on Baroo. The menu is concise, about eight items (with the occasional special), and mostly vegetarian. 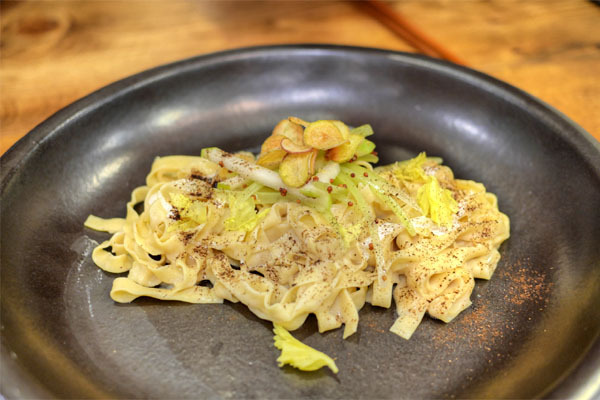 The majority of the dishes consist of ferment-y things over starch/grain (with much of the produce coming from Kim's home garden), and are meant to mimic the dinner bowls enjoyed by Buddhist monks. 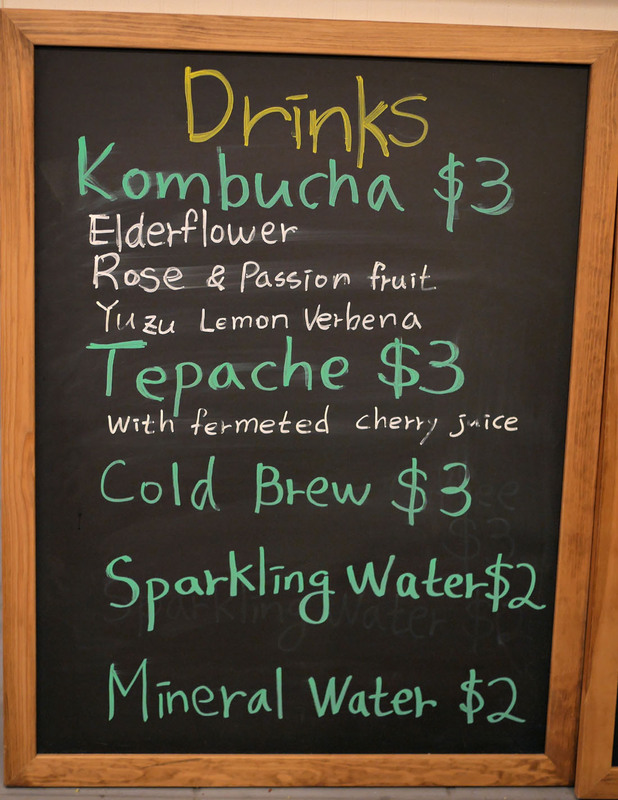 There are also a handful of desserts, while drinks comprise housemade kombuchas and tepache. This homage to nuruk was one of my favorites. 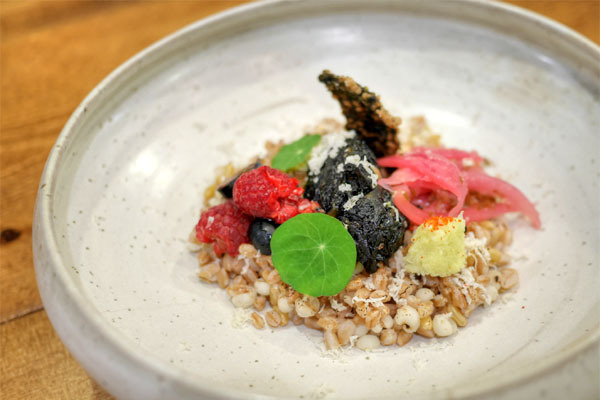 A lot of wonderfully earthy, nutty flavors from the grains, amplified even further by the depth of that koji-beet cream while pickled onion gave the perfect amount of kick. Superb textures, too, from both the seeds and the nuts. Another winner was this curiously-named dish, which conveyed mass amounts of brine and umami at first, which transitioned to a lingering, tingling heat as things progressed. The rice served as a great base for all the strong flavors, and the brightness from the tomatoes was appreciated as well. shiso beet - Great crunch and shiso mintiness on the back end. passionfruit kraut - Tart throughout, but with permeating notes of passion fruit sweetness. onion + lime + jalapeño - My favorite of the bunch with its mix of sour and spicy; would be fantastic on some tacos. 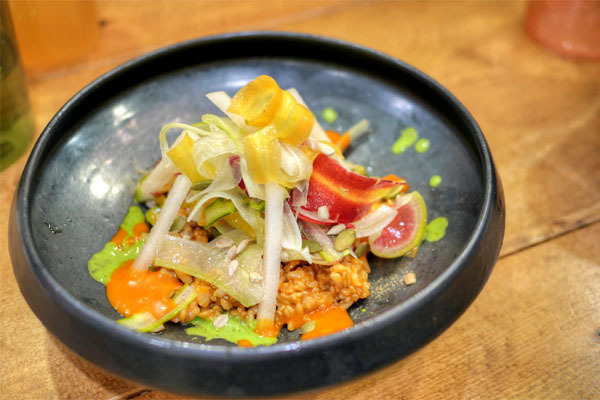 Napa cabbage kimchi w/ pineapple jus - Strong pineapple tartness against a backdrop of traditional kimchi flavors. red onion w/ rose - Classic red onion tanginess finished with floral notes. celeriac + sweet potato - Savory to sweet, on top of funk. 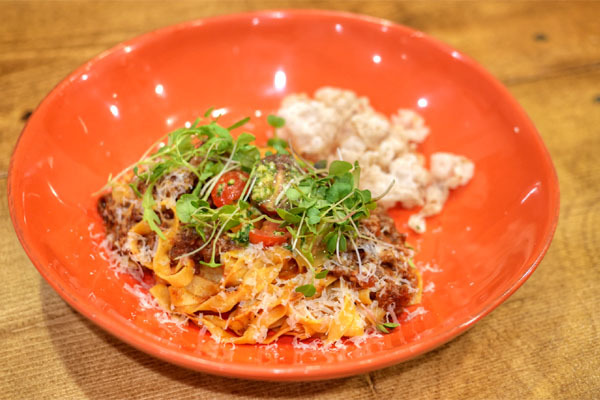 Our first of two housemade pastas delivered boatloads of the dark, rich, beefy flavors that you'd expect from oxtail, tarted up by a smidge of spice and a tempering sweetness. Nice textural component from the tendons, too. I enjoyed the Yuzu Lemon Verbena Kombucha [$3] more than I thought I would, finding it very puckering, with a suanmei-esque character leading to a floral finish. 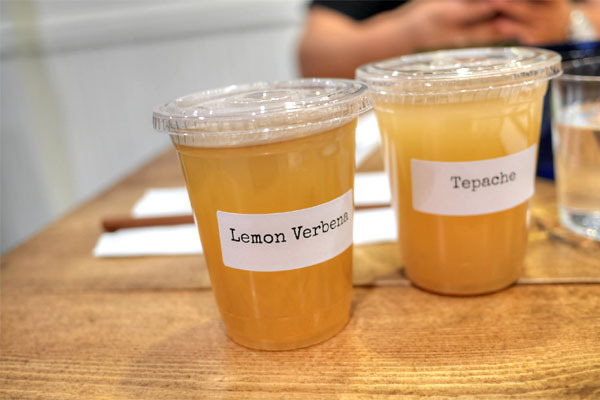 The Tepache [$3], meanwhile, tasted sweet 'n' spicy, with a base of pineapple and an additional zinginess from what must be the fermented cherry juice. The second pasta was lighter, though quite creamy actually, and really did a great job conveying the essence of both celery and celeriac. I thoroughly enjoyed the crunch provided by those chips as well. Not surprisingly I suppose, the fried rice was arguably my favorite course of the night. Just a superb texture on the actual rice here, which made for a flawless stage on which the various ingredients in the dish could really shine. I was especially fond of the potato chips and the hits of salt from the bacon, while pineapple added acidity. This salad was the lightest dish we had, and definitely hit the mark as well. 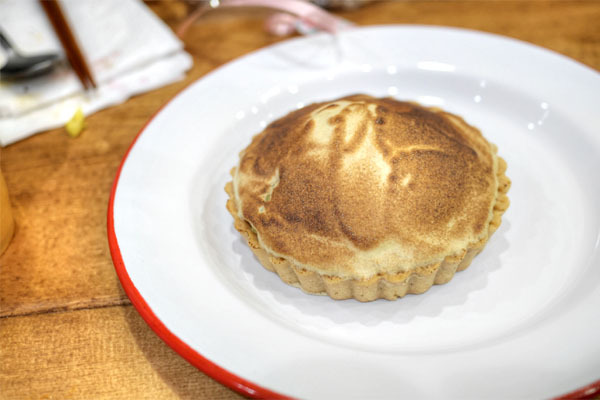 I was a big fan of the brightness and crunch of the veggies, and how that went with the sweetness of the fruit. And again, excellent texture and nuttiness from the grains. Well put-together. Our last savory brought out another standout. The grains here really wowed me, perhaps more so than in any other dish. As good as they were though, the star was the gim, with the seaweed imparting an intoxicating, in-yo-face umami richness that just made me want to keep eating. Interesting counterpoint from the berries too. Dessert time. 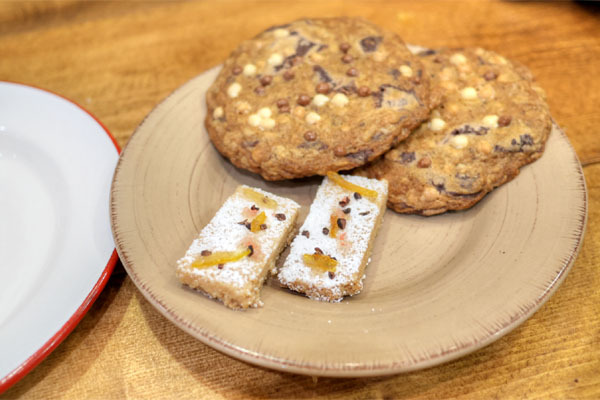 Rectangles of shortbread were delightfully crumbly, slightly buttery to the bite and tinged by pricks of citrus. 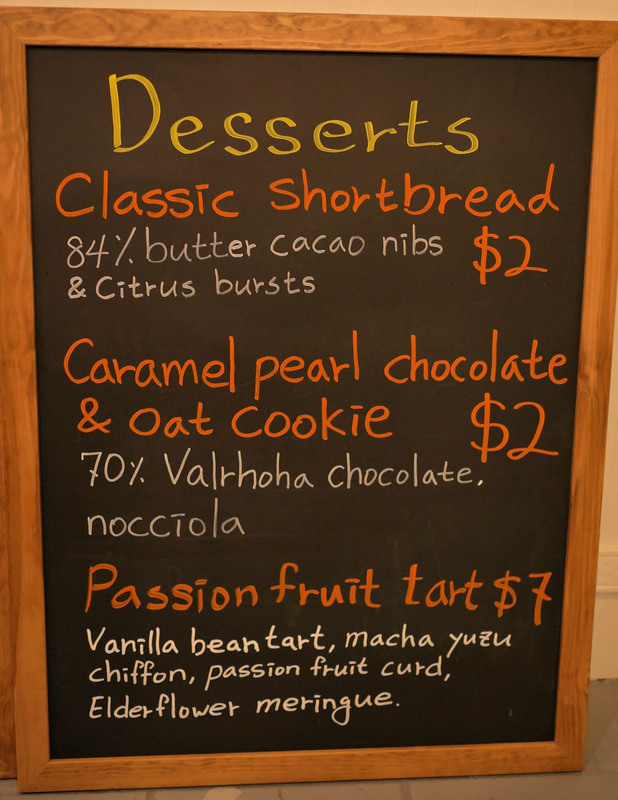 The cookies, meanwhile, were tasty as well, just sweet enough with a nice savoriness from the inclusion of hazelnut. Last up was the passion fruit tart, which showed off a great blend of sweet and sour flavors against a green tea astringency. Baroo's a bit odd, but also endearing, and we all really liked the place. 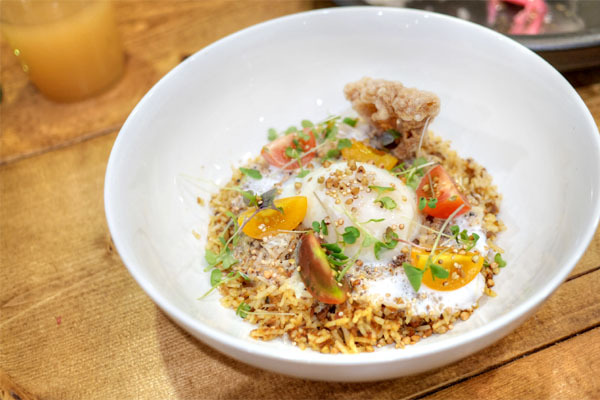 Clearly, the kitchen's pretty much taking this whole "bowl" concept to the highest level, with robustly-flavored, yet finessed preparations that still have a certain ease and humbleness to them. The place is one-of-a-kind, and I don't think I've encountered cooking quite like this in LA before. Uh and Kim are really on to something here, and we should all be looking forward to seeing where they take this. Be sure to give Baroo a shot before it blows up even more than it already has.